To make a fully-equipped and ready prepper base of operations or retreat you need stuff. Tons and tons of stuff. Knowledge and intestinal fortitude (defined this time as the inner will to do without creature comforts) can lesson the amount of stuff you need, but resources will still be required. Look around you, what is in abundance? Water? Wood? Dirt? Nottadamn? (as in nottadamn thing – if this is the case, you should think about moving.) Every ecosystem or area has something to offer, but rarely any has everything you need. In our case, we have tons of wood – a 1000 trees, give or take on just our land… not including the thousands of wooded acres surrounding our ranch. So, looking at the needs of (wo)man, we want to check as many boxes off that could be answered by wood. Cooking and heating come to mind. In order to use wood for cooking and/or heating, you most likely need a stove, fireplace, fire pit, or oven. Being the red-blooded, meat-eating, macho American men we are, we decided to make a wood-burning BBQ. Out of cinder blocks. Awesome. 1. Clear a decently level area where you will be putting the BBQ. Make sure the area has little overhanging foliage, and is far enough away from anything that may burn, ignite, or go bang. You can add some dirt or gravel to an uneven area to make more suitable. We actually used a pick to break up the rock hill and surrounding area to make our BBQ ground level enough. 2. 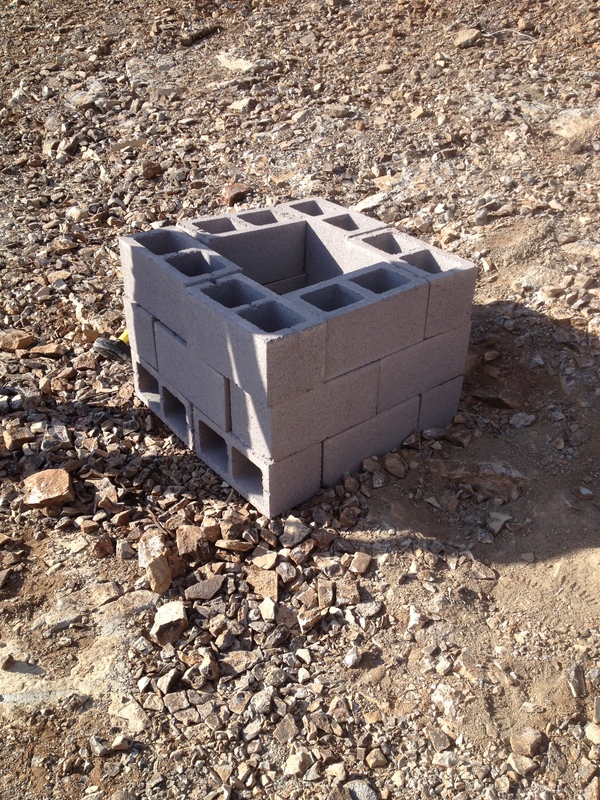 Place the cinderblocks into an interlocking pattern, as shown. Note that the bottom blocks to the front of the ‘Q are sideways – this allows for air to come in from the bottom and facilitate wood burning. 3. Put rebar in the corners of the holes shown. If made correctly, each rebar pole should “weave” through three blocks. Sledge in the rebar until it is below the top of the highest block. 4. 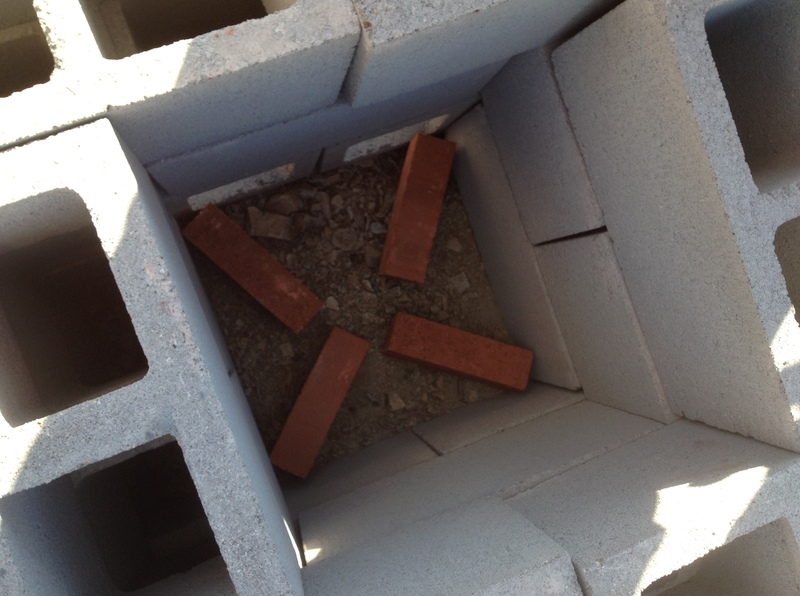 Put four bricks in the bottom of the BBQ as shown. This will elevate any wood put in so it will have better air circulation. 5. 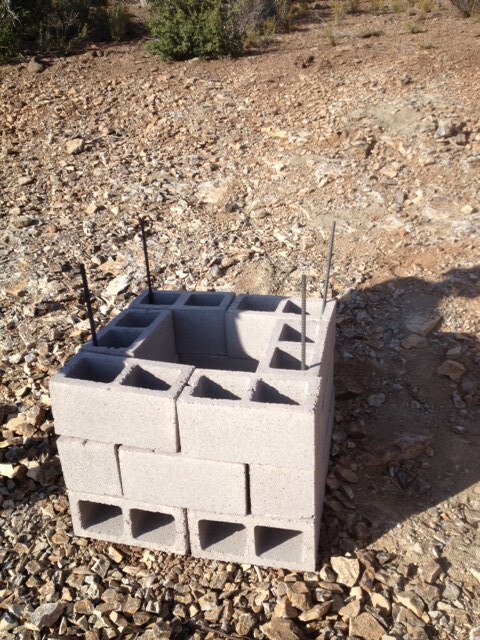 Use dirt and rocks to fill the cinderblock holes that form the back and side walls of the unit. You could use cement or something more permanent – but I like the fact I could break this down in like 5 minutes and move it, or design something else with the components. 6-11. 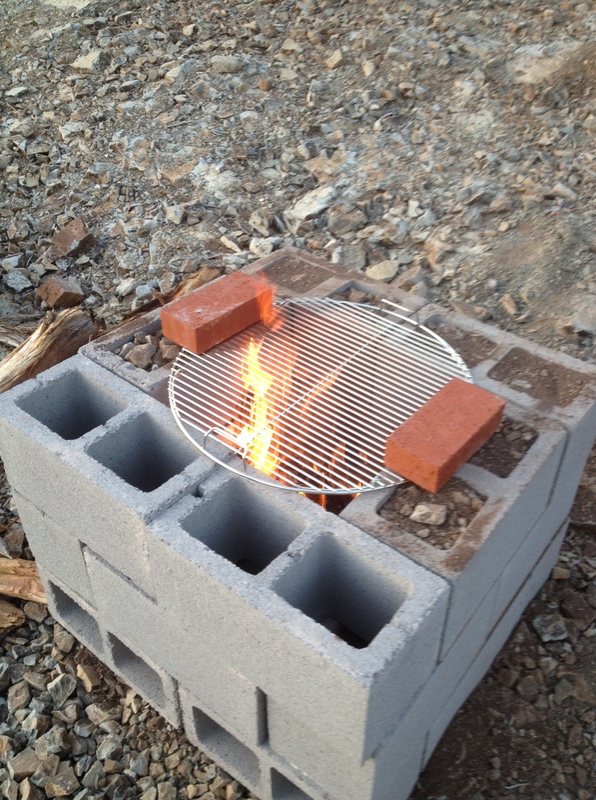 Fill with wood, light, place grill on top, use bricks to hold down the grill, place meat on grill, enjoy. We let the wood burn down to hot coals before throwing the meat and corn on, but it was just not hot enough at the grill. So, every few minutes, we moved one of the corner blocks on the front wall and threw on some twigs to get a small flame – this worked perfectly. 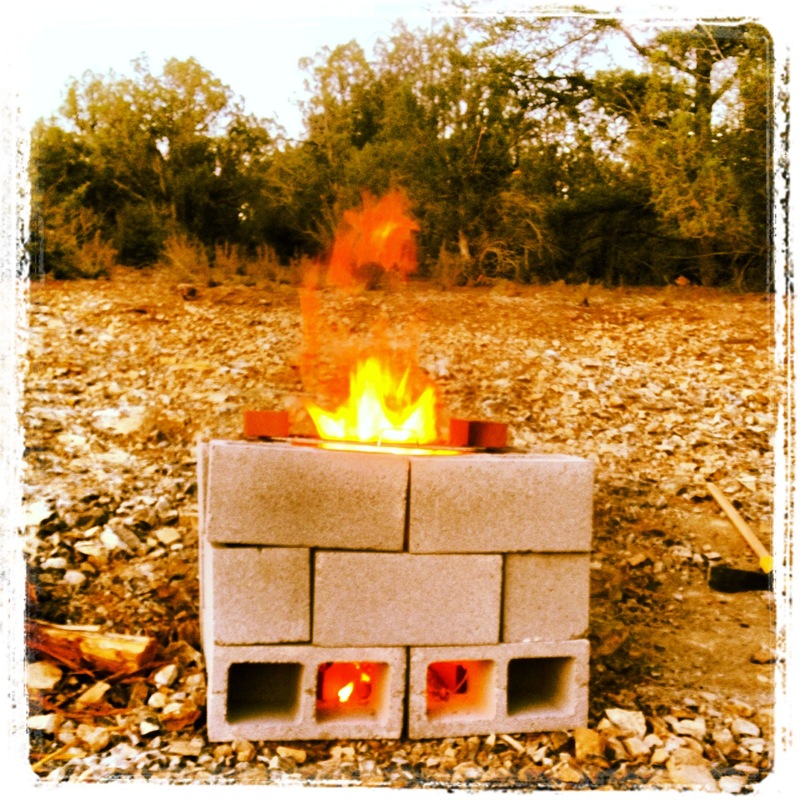 After cooking, we removed the top three blocks of the front wall to make a cool fire pit. When it was time for beddy-bye we rebuilt the wall and threw a block infront of the bottom air holes, and the fire calmed down nicely. 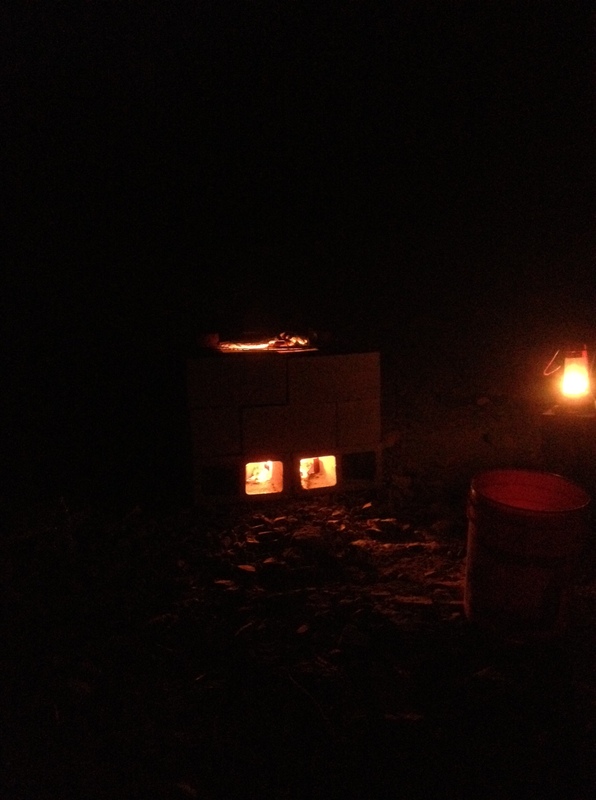 This entry was posted in Budget, DIY, FHR Theory, Food, MAG's and tagged Beans, Budget, cinderblock, DIY, Food, long term food storage, Mag, Prepper, shtf, Skills, Survival, Teotwawki, Training. Bookmark the permalink.